Kula contemplates his next Treibball Competition! We had a professional photographer come out to photograph Kula. Some of the photos are featured on our trainer’s brochures and publications (Living with Dogs). The photo above is one of many featuring Kula. Yes, he is a star! He is a gorgeous dog. Still exceptionally smart, motivated and very sweet. We still run with him and take him everywhere we go. 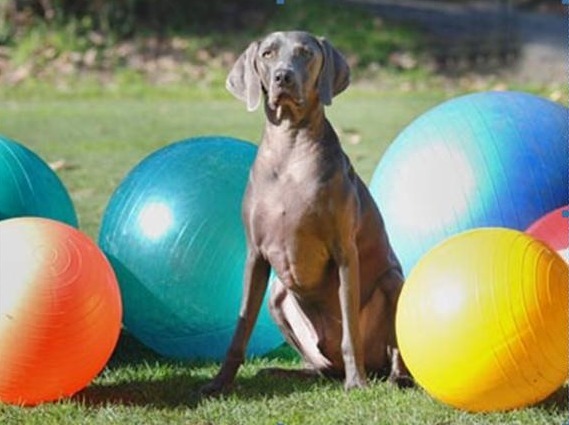 Of course you know Kula has been involved in other venues such as agility. From the beginning we have worked to see him reach his full potential. Recently, we broadened his horizon. There is a new sport here in the US called Treibball which is basically ball herding in competition. Our dog trainer (Sandi from Living with Dogs) is developing the sport here and will be starting to teach clinics here in Santa Cruz. Dogs and their humans will be traveling here for the clinics from all over the world. Kula is at the forefront of this new sport and one of the poster boys so to speak. For those contemplating any sport we suggest you get a quality bred dog. First you have to have one that is trainable, healthy, and smart. Secondly, look in the mirror. Do you have what it takes? Yes, you–you must have a high level of commitment. These venues take you out of your home several nights a week. Weekends are frequently taken up in preparation or at competition. Kula Bleu is the product of a lot of hard work and hours and hours of training, drills, brain development activities, patience and love. Finding an effective trainer has made all the difference between a good dog and an exceptional dog. I will always be indebted to Sandi for her work with both me and Kula Bleu. If you live near Santa Cruz, CA we hope to see you at an event soon! Click Here to see more photos of Kula Blue in Action! Breeder’s Note: We thank April for her commitment. For her dedication over and above what any breeder can expect. Many want a shortcut to having this kind of dog but it is not possible. The investment on every side is huge. We applaud her for all she has done. Kudos to Kula Bleu too! Posted on February 15, 2011, in Previous Pup Update, Storm X Zee, Treibball. Bookmark the permalink. 3 Comments.